Star-of-Bethlehem, the common name of the genus, Ornithogalum, belongs to the family Asparagaceae. It is a bulb flower, characterized by a tall, slender stalk, and clusters of delicate, star-shaped blooms. There are about 180 species of Ornithogalum, with the best known being O. umbellatum (common star-of-Bethlehem) and O. dubium (sun star). Ornithogalum's star-shaped, silky floretsbloom in stages all the way to the top of its flower head, a process which can take a few weeks. Other Names: Grass Lily, Nap At Noon. 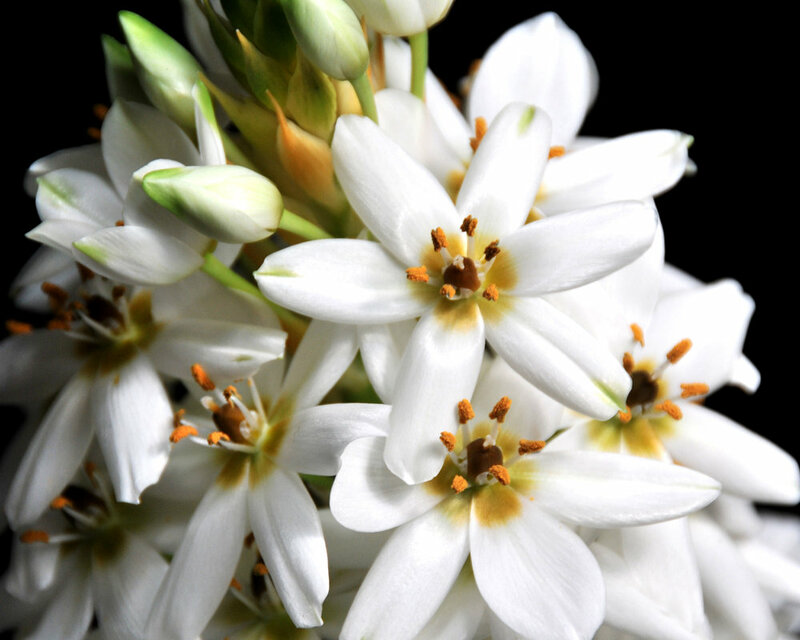 ORIGIN: Star-of-Bethlehem's 180+ species are widely distributed over several continents. The name, Ornithogalum, is derived from the Greek--ornithos for bird and gala for milk, which most likely refers to the white color of its flowers.